There’s good news for you if you have been waiting for the Galaxy Note FE Android Pie update. Samsung has started rolling out Android 9.0 for this handset. The company released this device quite a while after the Galaxy Note 7 debacle which seriously dented the reputation of this stellar series. The Galaxy Note FE or Fan Edition was meant for Samsung fans who really loved the Galaxy Note 7 but couldn’t hold on to it due to the mandatory recall. It was genuinely a good phone, the Galaxy Note 7, and would have done well had it not been for the battery problems. Samsung first released the Galaxy Note FE in South Korea on July 7, 2017. The company utilized leftover parts from the Galaxy Note 7 and unopened units of the original device to put together the Galaxy Note FE. The original battery was swapped out for a smaller and safe 3,200mAh battery. To ensure customers that it won’t have the same issues as the original device, Samsung put the Galaxy Note FE’s battery through its new 8-point battery safety test. It later released the device in select markets across the globe. The Galaxy Note FE Android Pie update is now rolling out, it’s firmware version N935FXXU4CSC4. We have received reports of the roll out from Saudi Arabia. It’s only a matter of time before the update goes live elsewhere as well. 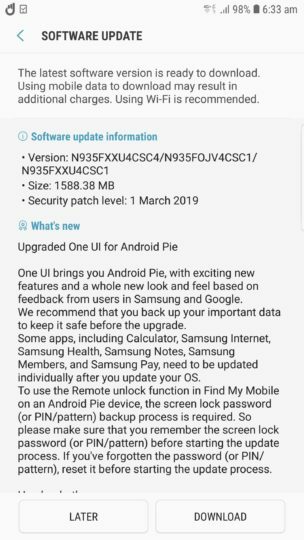 This release brings all of the Android Pie features for the handset in addition to Samsung’s One UI. The latest March 2019 security patch is included as well. Excited to finally get Android Pie on your Galaxy Note FE? You can manually check for the update from the Software update section of the Settings app, by tapping on Download updates manually.